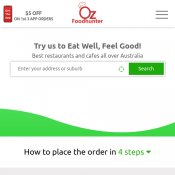 Get 5% OFF On Your Online Order @ OzFoodHunter, Use Promo Code OZ05. When you pay online. Additionally get $5 off on your Orders through Ozfoodhunter App. Earn $2 for each App referral. T/C - Sign up to avail offer.